Offering snacks to our pets is a sign of affection, the important thing is not to overdo it, as this could affect your daily diet. In the market there are a lot of options for these products, there are all the flavors, shapes and sizes, each designed to meet the size and tastes of the dog. In addition, most of them provide various health benefits such as the ones presented below. 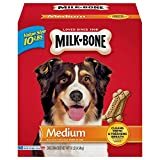 If you want to vary a bit and leave for a day your bones or bars for dogs, there are alternatives to sweet natural prizes that you can give to your dog. Provided they are in moderation, they are perfectly valid, healthy, and they will also love it! Remember that some foods are dangerous and even toxic to your dog. 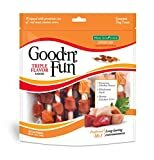 As you are interested in spoiling your friendly hairy with some snacks other than the usual food, you surely want to know what other things you can offer. So continue with me so you can learn what may be tasty and appropriate or maybe not so much, for that special pet. Forget about sharing those candy bars, or any candy in general. Chocolate contains theobromine, a methylxanthine compound that is toxic to dogs in moderate amounts. In addition, that candy bar that is tasty for you can cause vomiting, diarrhea, abnormal heart rhythms, seizures, and even death. Many other goodies contain a sweetener known as Xylitol, which causes an increase in insulin production which can lead to liver failure. While you may not think of vegetables as a snack, the natural sugars that these possess, give a touch of sweetness making them a healthy treat for dogs. That’s why dog biscuits with carrots, or the same small carrots, as well as green beans offer a crunchy raw sandwich without adding too many calories. Fruits are another option that gives a natural sweetness. However, not all are good for your puppy. For example, grapes and raisins contain a toxic substance that can cause kidney failure, so leave this out of the furry’s diet. However, apple rings or their dehydrated version, as well as berries, bananas, and watermelons offer vitamins and fiber with a sugary taste. Two other natural treats that your canine can enjoy are peanut butter and yogurt. The peanut butter contains healthy fats and vitamins B and E. Therefore, fill a toy with a touch of this product will keep your dog happy for hours. For its part, yogurt provides calcium and active bacteria, which help your digestive system. More you should know, that not all yogurts are good for him. So look for a natural one without added sweeteners or sugars. 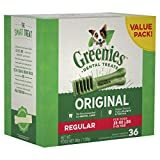 Below I will break down a short list so you know the variety of delicacies that you can give to your dogs as a reward for their good behavior, or simply to pamper them on any occasion in a healthy and fun way. Hard and crunchy sandwiches are available in a variety of flavors, shapes, and sizes. 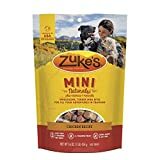 However, it is important that you be careful, the dimensions of the snack should be appropriate for the size of your furry, therefore, choose brands that meet the same standards as high-quality dog foods. 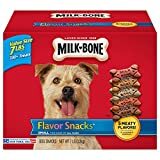 Soft and chewy treats are also available in a variety of flavors, shapes, and sizes. These trinkets are useful during training due to their pleasant taste and texture. 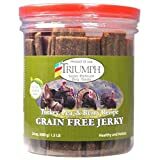 Freeze-dried treats and beef jerky, can offer a tasty snack similar to human food. These are usually available in a variety of forms and flavors, such as meats, poultry, seafood, and even liver. Chewable snacks and bone-like treats are not really made from the bones of animals. Some are made of corn starch or other digestible materials. One of its benefits is that due to the degree of chewing required to consume them, some experts believe that they promote dental health. More must be careful, although they are canine delicacies, making a comparison with real bones and other snacks, these chewable versions can cause injuries to the teeth and mouth, as well as a gastrointestinal obstruction if they “swallow”. They are made with the ears of the pigs and they really are delicious delicacies for your dog only that they are greasy. They can also be processed with chemicals that can be considered unsafe. Personally, I recommend avoiding this type of snack, especially in dogs at risk of obesity and diabetics. In general, rawhide for dogs is not recommended, as they are made from animal skins that have often been treated with various chemicals. In addition, this byproduct can sometimes cause gastrointestinal obstructions or other complications. Therefore, it is better to reward them with “bones” based on corn starch or chewable versions of carnage that have been developed by specialists. Giving human food to our dogs can be good or bad depending on the type of food. Foods that should be avoided include but are not limited to cheese, hot dogs, crackers, among other similar “food scraps”. Conversely, fresh foods such as carrots, apples, lean meats, poultry or seafood can be beneficial for your plugin. These sweets should not contain condiments or sauces, nor should they be given in bulk. Special dietary treats are sometimes made by the same food company that makes the pellets. If not, I suggest asking your veterinarian if there is an appropriate substitute or what is the most recommended among those that are available for sale. Good nutrition is the key to a long and healthy life. That is why it is so important to check that the recipes of the products you buy have ingredients approved for dogs. You should also look for the existence of organisms that guarantee and regulate the quality of them, this will guarantee the health and happiness that your furry children deserve so much. Natural treats for our furry often use ingredients of guaranteed quality. The container, for example, can give you a clue about the exact constitution of the snack. Dog trinkets made with artificial ingredients and low-quality contents are often made from animals that have been fed hormones and antibiotics. In the case of hormones, it is done with the intention of stimulating growth and rapid muscle development. For its part, the use of antibiotics to animals is administered to protect them from diseases. This can have consequences for your pets such as immunity to certain medications, hyperactivity, and other health conditions. Therefore, be careful about looking for a cheap alternative. They are snacks that are made with fresh ingredients, in addition, they do not contain the artificial additives that are usually found in other sweets to enhance the flavors and color. The quality components do not require additional artificial flavors and different colors can be achieved using safe vegetable-based dyes. Dogs, like people, can be allergic and intolerant to food ingredients. Therefore, the change of a food product or candy of low quality to natural, can reduce inflammation and decrease the severity of these reactions, as a result of higher proteins and grain sources used. In this respect the oatmeal can be really good, helping to digest the snack in a soft way for the stomach. Equally leaves, less foul-smelling excrement. Because these sweets are made with superior components compared to the lower quality products, the cost could be a little higher, however, we must remember that those made with high standards in terms of ingredients and processes, will provide a snack with a higher and more delicious nutritional value. 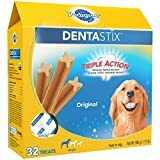 The good thing is that many natural sticks can also contribute to improving dental care, as they avoid adding processed sugars to the formulas of their products, preventing the appearance of cavities. If your partner is on a diet, it can be tempting to eliminate the sweets completely, especially since it can lead to boredom and chew other household items. That is why, by switching to quality natural snacks, you will ensure a safe source of protein and low fat, becoming a useful way to help them lose weight, leaving them satisfied and without taking away their favorite rewards. These natural and specialized snacks can help stimulate the immune system of your pets; proteins are essential to strengthen it, and natural foods provide them with an unparalleled source of protein. For this reason, I suggest you look for those that contain lean meats, chicken and lamb, and not the sandwiches that simply place generically: “meats and animal derivatives”.